Divergent is perfectly tailored to it's young adult target audience, without neglecting the needs of the older audience. While many aspects of the film are stereotypical to it's genre and predictable as a result, it sets itself apart from the rest with it's suspenseful plot and intense action sequences. Fans of the book will have no complaints (or only very minor ones) about the bestseller's transition to screen, but for those who haven't read the book there may be some confusion over particular aspects of the dystopian world of Divergent. Set in the future in the city that used to be Chicago, all inhabitants are divided into five factions based on human virtues. These factions are Amity, Erudite, Abnegation, Dauntless and Candor. When they turn sixteen, the young of each faction face an aptitude test to find out where they really belong. When Beatrice Prior (Shailene Woodley) completes her test, she is told that her test was inconclusive and that she is Divergent, meaning she exhibits behaviour typical of all factions rather than belonging in one. She is told how dangerous it is to be Divergent, and instead chooses Dauntless over staying in Abnegation. 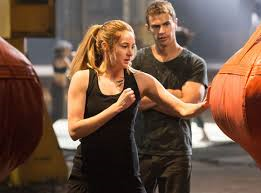 In Dauntless she must face a number of initiation tasks in order to stay in that faction, but more importantly, she must do her best to convince everyone that she is not Divergent. The novel of the same name by Veronica Roth is a piece of fiction targeted towards the young adult audience. Yet, like many young adult novels these days, it is extremely popular with older audiences as well. The film works in much the same way as it is enjoyable for people of any age. On the other hand, it cannot be mistaken as a film in any other genre as all the things that have become known as being stereotypical parts of a YA novel turned film are there. Of course, the main character is 16 which places it in the YA genre territory straight away, but there is also the obvious romance between Tris and Four (Theo James) and the dystopian living with a fight for survival. All things which we have seen in one or two YA films before. So there really is a great deal of predictability regarding what will happen to who. However, this doesn't matter when it comes to the film overall. It is still very entertaining and has made the transition well to the big screen. Those who have read the book will notice that the violence has been toned down a great deal from the book and there are a few things that are missing, but that is to be expected considering the film was already over two hours long without these things. 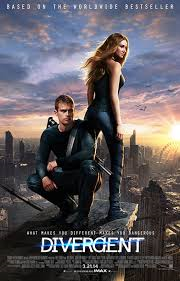 In the latter half, Divergent becomes extremely action packed and the physical fighting scenes are very well choreographed and entertaining to watch. However predictable it can be at times, the film is still very suspenseful as a result of these battle scenes. The idea of the five factions and being Divergent and factionless can be a bit of a task to take in and understand, especially for those who haven't read the book. The physical world of Divergent is wonderfully brought to life. From the beginning shot just outside the city with the deserted ship on the open plain, you are blown away by the reconstruction of Chicago to make it look as though it is futuristically war torn. The whole film is so visually intriguing, especially the images of the train and during the flying fox scene. 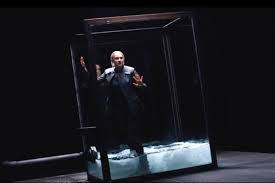 The musical score is also perfectly suited as it has an edgy, suspenseful and futuristic feel to it, but can also feel as though it is trying a little too hard to add to the atmosphere of the film. Shailene Woodley is perfect as Beatrice, or Tris as she becomes known as. Her character development throughout the film is perfect, as she changes a great deal from when we first meet her. When Tris is first met at the beginning of the film, it is not expected at all that this meek and curious little girl could become who she is at the end of the film, but she does so gradually and believably. Woodley, although good throughout the whole film, has one particularly memorable and powerful scene which is quite hard-hitting and emotional. Woodley works well with Theo James, who plays her love interest. There is a great amount of chemistry between the two. James is perfectly cast as Four, who has a great deal of charisma due to his mystery. Jai Courtney, who plays Dauntless leader Eric, is also very well cast as he is just as charismatic, but in a dangerous way. Zoe Kravitz and Miles Teller also do very well as Dauntless initiates who have a great deal of character. It is great seeing Kate Winslet in such a different character than what she usually plays, and she is wonderful as Jeanine Matthews, Erudite's leader. Divergent is an entertaining watch and although not the most unique and creative of the young adult novel turned movie category, is certainly not the least enjoyable.